This is the oldest film to have graced the pages of BoGD and it's an undeniable classic. Betsy Collins (Frances Dee), a nurse who travels to a secluded West Indies island to care for the catatonic wife of a wealthy plantation owner, finds the beauty of the tropics a thin veil for the deep entrenchment of mysticism and voodoo in the once-slave population. The owner, Paul (Tom Conway), is a man of worldly flare yet immense sorrow over the cognitive loss of his wife while his business partner, Wesley (James Ellison), sinks only further into alcoholism. 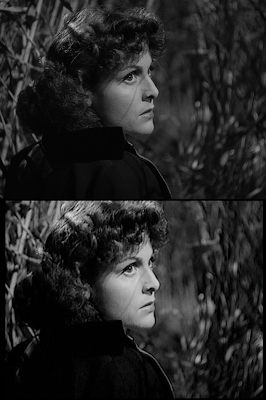 Wesley's mother (Edith Barrett) harbors a dangerous secret involving the ill woman and the ritualistic voodoo practices held in the tall fields of the plantation. 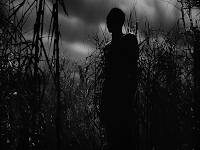 Director Jacques Tourneur produces some astoundingly moody black and white photography, but what's most interesting is how the film treats race for its time. The black population is still deeply affected by the circumstances of their ancestors' forced arrival to the island and Betsy is naive to their plight only seeing the topical beauty of the place and its people. Through exchanges between her and these "natives", one gets the impression of a boiling tension just below the surface. As for Warner's DVD, paired in a double feature with Robert Wise's The Body Snatcher (1945), picture quality shows a vast clean-up, but the film didn't receive a painstaking restoration. Flecks, pops, slight frame fluttering, lite nitrate damage, and one really bad tear are apparent throughout, but this presentation looks far superior to Manga Films' Spanish DVD which was previously the only other digital release available. One of my all-time faves. Plus, it scooped the whole "Pride and Prejudice with Zombies" phenomenon by more than half a century--a zombie movie based on the classic Jane Eyre! This is a great dvd. The other feature, THE BODY SNATCHER, is another of my all-time faves, with what's for my money Boris Karloff's greatest performance. Thanks a whole lot for this suggestion, I was not aware that it was directed by Jaques Tornier, he is the same guy who directed the excelent "Night of the Demon" on which Raimi's Drag me to Hell was inspired on. Thanks for your review: I adore this film. Interesting what you said about how the filmmakers treat issues of race too - for even the zombie character is treated with dignity and sympathy. Great film. Oh wow, I didn't even know about Night of the Demon. It sounds interesting. I'll have to check that out soon. I only discovered it a few years ago after reading Jamie Russell's excellent Book of the Dead, but I Walked with a Zombie is one of my favorite "classic" horror films. It's up there with Dracula and Frankenstein. Definitely a must see for any self-respecting horror fan.